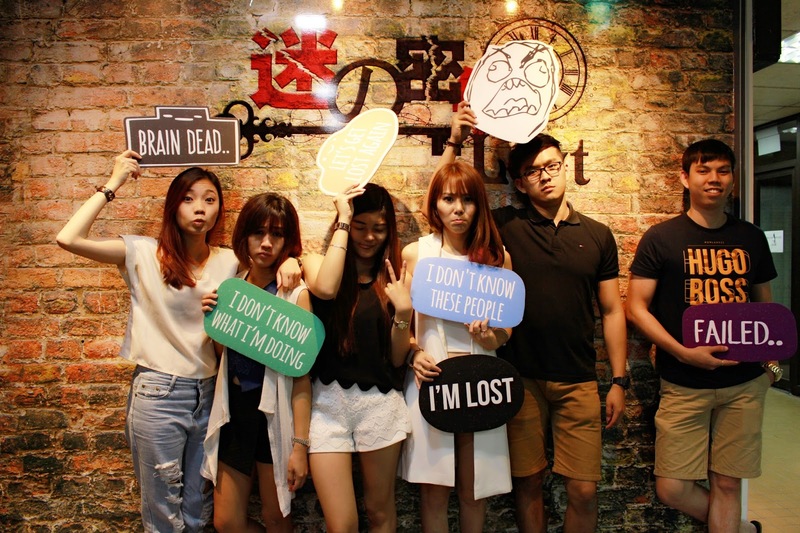 Get LOST with your friends at LOST SINGAPORE! + GIVEAWAY ON MY INSTAGRAM! 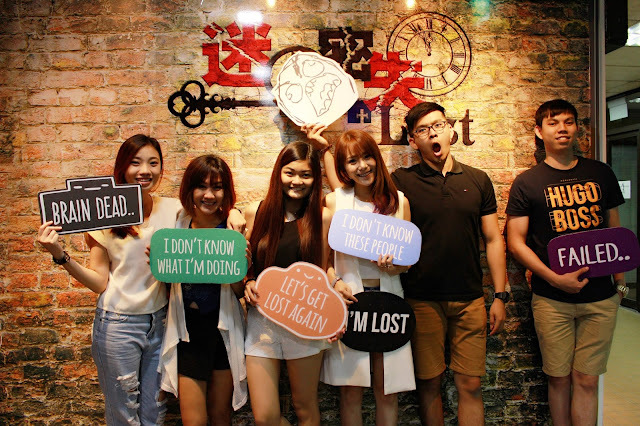 A week ago, my friends and I had a chance to experience a game at LOST Singapore! If you don't already know, LOST SG is a high-tech real-life room escape game where players have to put together intriguing clues, solve some challenging puzzles and race against time to escape from a locked room. Pay attention to every little detail in the rooms, because even the slightest object could be the key to your escape out of the locked room! The reason why LOST SG is so interesting and different from the rest is because it uses latest technology in the games' rooms - expect to solve mysteries and puzzles and doors/gates/crates/anything at all will automatically open/move when you get the right answers! Watch this video about LOST SG to find out a little more! There are 5 games/rooms available. They are each of different story lines and of different difficulty level! Let's start with the LEAST DIFFICULT one first. "From the very beginning, we were all in this together and we swore to leave no man behind. Unfortunately, things often don’t go as planned, leaving us without a choice...."
during its operation from 1934 to 1963.
no inmate was thought to have ever successfully escaped the maximum-security facility. One fine morning, wardens discovered the disappearance of 3 inmates. Did the inmates make it out of Alcatraz Island braving the unforgiving currents or did they perish into the dark waters of San Francisco Bay? WILL YOU SUCCEED OR WILL YOU SUCCUMB TO THE HANDS OF FATE?" "Words were going around that the British and French forces were planning to invade China. As a precautionary measure, I hid the sculptures in my home in a desperate attempt to safe-keep them....."
"In the 1860s during the Second Opium War, the British and French Empires invaded China. In the midst of the war, all 12 of the zodiac head statues designed by Giuseppe Castiglione for QianLong Emperor miraculously disappeared from the Imperial Summer Palace. hometown of the zodiac’s designer home. Take on the role of a secret agent and unravel the mysterious hidden castle belonging to Castiglione. Your mission is to recover the 12 zodiac heads and escape from the Castle. But BEWARE, there might be guards on patrol. Escape, Survive & Recover the 12 Zodiac Head Sculptures." "When all hope seems lost, a man appears and promises to lead us to a place we can truly call home. A long journey it has been, will we get the future we yearned for?" "Enslaved and oppressed with forced labor, life as an Israelite in Egypt was tough and difficult. Often beaten up and yelled at, it was not long before the Israelites lost all hope and fell into despair. On a scorching afternoon, a mysterious stranger came to town. An Israelite by birth, he demanded the Pharaoh to release his people from slavery. That moment changed the fate of the Israelites. It took long before the Pharaoh relented. And on that fateful night, they followed him as the new leader and made their way out of Egypt; hearts filled with hope and joy. Regretting his decision shortly, the Pharaoh made his chariot ready and took an army with him to give chase. THE FIGHT FOR FREEDOM HAS BEEN LONG AND HARD, CAN THEY ESCAPE THE CLUTCHES OF THE PHARAOH?" Resting on rich volcanic deposits, the magnetic fields of Aokigahara interferes with modern navigational instruments. A vast forest, it is easy to get lost. Yet, rumour exists that one can rely on the stars above to guide them. "After walking in rounds around the forest, it was clear that we had lost our way. With no functioning equipments to guide us out, fear was slowly consuming us from within. While we are paranormal researchers by profession, the fact remains that we are lost inside Japan’s Suicide Forest. Historically linked with demons and supernatural beings, Aokigahara is not a place to spend a night in. As the sun sets, the forest is getting dark. The macabre side of Aokigahara slowly sets in as I feel someone whispering behind my ears, leaving me unsettled. GRIM FATE AWAITS US, I FEAR THIS WILL BE OUR LAST…"
AND WE WERE SOLD BY THE POSTER AND STORYLINE AND CHOSE THIS!! The professor’s love for mechanical puzzle is evident from his laboratory. Full of mathematical problems and equations, it will tax your brain. Get ready for a good brain workout. "While exploring for new study materials to better engage his students, Professor Rubik invented the Rubik’s Cube. Overwhelmed with the sudden onslaught of attention, Professor Rubik fell into the claws of depression. Driven by heavy criticisms, Professor Rubik remained unfazed and began working on a new project. Back at school, students are concerned about Professor Rubik’s absence and decided to drop him a visit. They soon found out from his family that the Professor went into the lab, and he has no intention of coming out. Where is Professor Rubik and what is he doing? Your assignment, should you choose to accept is to unearth the mysteries within and find Professor Rubik. CAN YOU FIND PROFESSOR RUBIK AND MAKE IT OUT IN TIME?" Hehe so here are some photos of the room. I am not going to say anything to you, but I have to tell you - IT IS VERY EXCITING. the puzzles we have to solve. I like the fact that we all went in confidently thinking that we are able to solve it, and we went in with very individual mindsets and going around and about the room by either in pairs or ourselves not working together to solve the puzzles. And we wasted too much time doing so. in order to put the answers altogether. We were thinking of going back again, but this time round we are going to try EXODUS as it is one of the easier game and we will try to test our intelligence level first before we explore something harder like ISOMETRICK. I was told by the Operations Director that Exodus and Alcatraz would be more suitable for beginners, so perhaps if you have never tried to play such games before, it would be great to start with either one of these! The games are usually played in groups of 4 and above and before you enter the room, you are to watch an introductory video to the game itself. You are also required to go in empty-handed; the only reason why is to let you have the optimal experience of the room without any help from the internet (heh heh heh) and also other distractions. Free lockers are provided for you to put your stuffs in! You are also advised to play the games dress comfortably for maximum game enjoyment! For our game, we were required to do things like crawling, etc. I'm pretty sure other rooms might also have such requirement so it will not be advised to wear heels or miniskirts! Can I emphasize how affordable and worth it the price packages are??? For non-peak they are charging only $20.90 per pax, and $26.90 during peak periods! - unless you pay for 7pax to book the entire room to yourselves. Hehe thank you guys for coming with me, and special thanks to LOST SG for this exciting game! So.... ARE YOU READY TO BE LOST???? There is a giveaway happening over at my IG - the winning party will get go to LOST SG and bring along 5 more friends to play any game of choice!!! HOP OVER TO MY INSTAGRAM TO FIND OUT HOW! Please call them at 67171688 (Main Line) / 68714044 to make a booking before heading over!